Disclosure- I received the below in order to facilitate this post. All opinions are my own and honest. Please see “I disclose” for more information. You all know by now how girly my girls truly can be. They absolutely love to dress up and do anything they can to accessorize themselves. 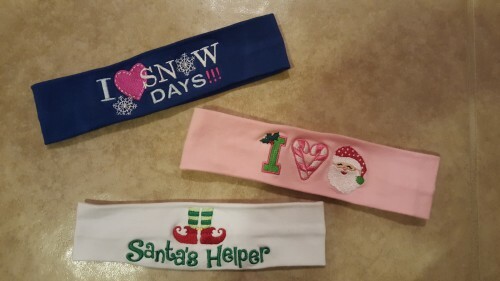 They were so excited to receive these adorable headbands from Logo Loops for the holidays. Logo Loops, LLC produces a custom embroidered cotton/lycra stretch headband as well as “ready made” styles. Each of their headbands is a quality product manufactured and embroidered in their own workshops. The “loops” can be worn as a fashion statement, sports accessory, or team/school/camp spirit-building product. Each headband is made of 90% cotton/10%Lycra stretch. The headbands are all machine washable and can be tumbled dry. Logo Loops ensures that each band maintains it’s “memory” and is non slip for girls who are always on the go. These stretchy accessories wont’ cause a headache unlike stiff wire or plastic headbands. They run 2 1/4″ wide, the perfect one-size-fits-all.